[insert nifty annotation here] In regards to my own research, de Pedro Ricoy’s article is extremely useful as the author breaks down the global advertising strategies of the top three game companies — Sony, Microsoft, and Nintendo — based not only on gender, but also on nationality, language, and cultural expectations. It is fascinating to think of all of the elements that have to be taken into account as the public relations and marketing teams plan the release of games and consoles, and how a misstep in any of the plans can lead to decreased interest in an entire country for the products associated with that console. One of the author’s examples that gave me pause was the lack of interest by Japanese consumers in Microsoft’s Xbox because Microsoft had chosen a date they thought would be auspicious without doing enough research to find out that Japanese employees would not be paid until a few days after the release date, leading the Japanese to doubt Microsoft’s ability to successfully localize their campaigns. As I move forward with my analysis of Sony’s “Greatness Awaits” campaign commercials in North America, de Pedro Ricoy’s article will give me a foundation through which to understand the rhetorical strategies that formed the basis of Sony’s approach to localizing their campaign to draw in an American audience. For her article, de Pedro Ricoy approaches the topic of localization versus internalization and the rhetoric employed in global video game advertising through the lens of translation theory, marketing, and semiology. The main research question seems to be centered on what type of analysis would be best suited to exploring and evaluating the marketing strategies of video game console developers as they reach out to global audiences, and whether it is localization or internationalization that is most prevalent in these strategies. With regards to the methodology, the author establishes the target audience for video game marketers by moving through the demographics of the players and the buyers as well as discussing the importance of global marketing strategies to the success of the top three video game console developers— Sony, Microsoft, and Nintendo — as they spend millions of dollars in their quest to draw in new players while continuing to cater to existing fanbases. As she moves through her analysis of global advertisings by Sony, Microsoft, and Nintendo, de Pedro Ricoy looks at examples of textual, static visuals (promotional images), and televised advertisements to explore how the companies’ marketing teams attempted to either localize their advertisements to a specific country/culture they were trying to reach, or internationalize their advertisements in order to reach the greatest number of potential buyers/players with the belief that globalization has eroded cultural boundaries. The author highlights how certain advertisements were received in the countries they were targeting and notes how/why some failed (sometimes miserably) in those countries. de Pedro Ricoy (2007) concludes that “it seems that internationalizing strategies (which imply a degree of foreignization) are more prevalent than localizing strategies in the global campaigns for these products. Whilst different regions may have preserved their overall cultural singularity, certain demographic segments (young, relatively affluent consumers, in this instance) share a common identity that transcends geographical borders” (p. 273). She also lists four “examples of linguistic translation” that she uncovered while doing her research: “1) Literal translation, 2) Free translation, 3) gist translation, and 4) Generation of new text (based in a set of common features) in the context of copy adaptation” (de Pedro Ricoy, 2007, p. 273). In regards to my own research, de Pedro Ricoy’s article is extremely useful as the author breaks down the global advertising strategies of the top three game console companies based not only on gender, but also on nationality, language, and cultural expectations. It is fascinating to think of all of the elements that have to be taken into account as the public relations and marketing teams plan the release of games and consoles, and how a misstep in any of the plans can lead to decreased interest in an entire country for the products associated with that console. One of the author’s examples that gave me pause was the lack of interest by Japanese consumers in Microsoft’s Xbox because Microsoft had chosen a date they thought would be auspicious without doing enough research to find out that Japanese employees would not be paid until a few days after the release date, leading the Japanese to doubt Microsoft’s ability to successfully localize their campaigns. As I move forward with my analysis of Sony’s “Greatness Awaits” campaign commercials in North America, de Pedro Ricoy’s article will give me a foundation through which to understand the rhetorical strategies that formed the basis of Sony’s approach to localizing their campaign to draw in an American audience. This post covers my responses to two of my peers’ Digital Writing Assessment & Evaluation Annotated Bibliography entries. For this particular assignment, I chose to respond to Jenny’s entry on Reilly and Atkins, and Leslie’s entry on Brunk-Chavez and Fourzan-Rice. I chose Jenny’s annotations on Reilly and Atkins’ article, “Rewarding Risk: Designing Aspirational Assessment Processes for Digital Writing Projects,” as it seems to align very well with the article I read by Eidman-Aadahl et al., “Developing Domains for Multimodal Writing Assessment: The Language of Evaluation, the Language of Instruction.” Reilly and Atkin’s emphasis on the process of designing assessment that did not alienate students (rather, it encouraged them to be a part of the process) was encouraging, especially in terms of “trial-and-error” and students being self-reflective about how they chose to approach the work. Both trial-and-error and self-reflection are tools for people to become aware of their own processes, which can be critical when a person is struggling to learn and master new material and technological tools. Jenny did an excellent job linking the material from the article she read to not only what we are reading in class but also the kind of work and the digital tools that we are all slowly developing skills within. So often, work in the classroom becomes more about a percentage than the skills that are being learned and refined while working through material. I have seen some college professors and grade school instructors who were very concerned with their students proving themselves in a number scale that showing progress in learning course content was placed second. In their assignments, the students seem to come up against assessment that was all or nothing. The process of learning and producing should be even more important than the grading system that only looks towards the final product without any regard for the academic journey of the student. With the rise of digital writing projects and the fluidity with which such technologies can offer students in terms of not only how they produce their texts but also how they distribute them, is going to be very informative in watching students and instructors learn to navigate their changing relationships to texts. Leslie’s article annotation on “The evolution of digital writing assessment in action: Integrated programmatic assessment” by Brunk-Chavez and Fourzan-Rice was fascinating in that, as a case study, it was concerned with a particular instance of digital writing assessment in a way that Jenny’s article and my article were not. It was fascinating to read about the University of Texas at El Paso (UTEP) acknowledging that new technologies require the curriculum and instructing practices to adapt so as to “improve student feedback” processes, “professional development,” “improved quality of programmatic assessment and feedback,” and to enable “students to write for a discourse community beyond their instructor.” While the goals of the program are laudable, the concern of students about feeling alienated from their professor (ideally, the one person whose aid is what they come to depend on in terms of learning how to improve and to seek guidance from) as their work is sent to “WriterMiner…. [and] then randomly distributed to the Scoring Team, which is made up of first-year graduate teaching assistants,” raises questions not just about the language of assessment as seen in other articles in the Digital Writing Assessment & Evaluation, but what kind of structure should be in place so that students learn to work within in a digital learning atmosphere and what kind of network of evaluation would emerge to allow for an efficient “programmatic consistency.” My former university had something similar to UTEP’s process. The course was a required Humanities class taken by all students who had entered into the university with 59 credits or less (Junior-level transfer students lucked out), and was solely online. The course is strictly online and has an enrollment of up to 400 students a semester, divided between instructing professors with a certain number of graders assigned to each instructor. The material for the class was divided into two modules–Art and Music–and each module had designated units, which were based on different styles and mediums. While the class sounded highly efficient, students and graders tended to get lost in the mire. Each grader was generally in charge of anywhere between 40 to 75 students (though some graders could take on a greater number of students, but those were exceptions rather than the rule), so responding to student work was done through general stock comments according to a rubric that was both very specific (in terms of what needed to be covered) and very vague (in terms of how those content items should be covered). The students themselves never met their instructors (as the content of the course did not vary from semester to semester) and dealt virtually with their graders (who were better known as proctors). The course itself became a kind of assembly line of learning and the critical skills required of students in the coursework was meant to be learned elsewhere and channeled into their writing (despite most students taking the class were usually freshmen with no prior college writing classes). The course was redesigned my final year working with the university, but the administrators’ stance was that there should be stricter rules and more of them (many more rules) so that passing the course was a matter of moving through a checklist rather than strengthening critical and creative academic skills. That was a long-winded explanation to make a point that both Leslie’s entry and my experience with that Humanities course is that it seems instructors and administrators are right in the idea that curriculum and teaching styles should adapt to integrate new technologies, but the new technologies should not cause students to feel alienated. As digital assessment and evaluation are newer to the academic environment, some trial-and-error are to be expected, but the ultimate goal should be the encouragement and facilitation of student learning with an emphasis on students’ coming to understand their own progress with the materials and tools. We can run no longer. The era of critical making is here. Daniel's blog discussed the implications of data collection in digital spaces, and Leslie's blog discussed the need for digital composition and assessment strategies. Both have the inherent argument that the ramifications of digital spaces are firmly embedded within our discipline. What this tells me is that as scholars and instructors we have the responsibility to understand how to create technologies for scholarship and the classroom. We have to understand it as fully as teachers need to understand anything they teach and as scholars need to understand to analyze. It's a kind of fluency with technology production that most of us lack, or are scared of, or refuse to accept is part of the discipline. If there was a historical schism between linguistics and English, oral communication and English, and creative writing and English, with these disciplines being splintered off from the department, we must do the opposite for technology. As it now exists in completely separate discipline, technology studies needs to be enveloped by English studies. We have to bring these courses in technology production, management, and theory into our world alongside our surveys and seminars in literature and rhetoric. If we are going to teach students to be producers of digital content, we must understand the technology that facilitates that production. The time has come; I hope it has not passed. The assignment for this entry asked for a summary of what/how/why I learned. The what is pretty easy. My comment above speaks to that. The how and why are far more difficult to answer. How did I learn? Collaboratively would be one way to answer that. My peers, whom I hold in the highest regard and regularly inspire and teach me, were able to comprehend the readings, coherently summarize them in their pieces, and offer broader implications for our course and discipline. The knowledge that I built is on their solid foundation, so in that sense I learned by working with Daniel and Leslie. These kind of jigsaw activities (I believe they are called if my memory of undergraduate courses in education are serving me right) are among my favorite ways to learn. Others often bring ideas to the table or make connections that I would not have made based on our diverse experiences and bodies of knowledge. Why did I learn what I learned? I was open. I was willing. I was humble in the face of the vastness of things that I do not know. My peers are intelligent. My instructors asked me to. The material was selected for me. I have been trained in and have practiced the active reading and critical thinking skills needed to learn. I have prior knowledge from which to draw. All of these are potential answers to the question of why I, or anyone for that matter, might have learned. But I think that the real answer here if that I learned these particular take-aways because I am acutely aware of the issues surrounding critical making or technology production as a result of my own research. The "why" is inextricable from the "what" in which I am interested. The human mind most easily makes the connections across the pathways that are already there. As new information comes in, my mind works to fit it into the files that exist, to see the relevance to that which I already find important. Perhaps this is why networks grow organically. I want to expand the nodes I value. I seek out the connections that can be made to and from it. 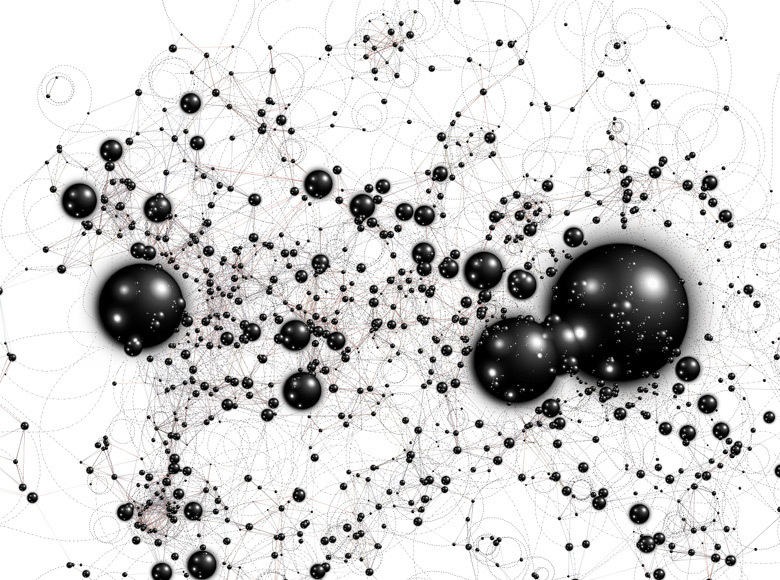 The network grows where knowledge can be easily created and around nodes that are most valued. Synthesis Post: What did I learn from the Annotated Bibliography? Eidman-Aadahl, Elyse, Kristine Blair, Dànielle Nicole DeVoss, Will Hochman, Lanette Jimerson, Chuck Jurich, Sandy Murphy, Becky Rupert, Carl Whithaus, and Joe Wood. “Developing Domains for Multimodal Writing Assessment: The Language of Evaluation, the Language of Instruction.” Eds. Heidi A. McKee and Dànielle Nicole DeVoss. Digital Writing: Assessment and Evaluation. Logan, UT: Computers and Composition Digital Press/Utah State University Press, 2013. Web. 30 Jan 2014. This article, written by the Multimodal Assessment Project (MAP) committee for the National Writing Project’s Digital Is…Initiative, identifies five domains they believe are “vital for the assessment of digital writing offers the possibility that the language of assessment can inform—and build upon—discussions more often associated with interaction, instruction, and text creation than with evaluation”: 1) artifact (“the finished product”), 2) context (“the world around the artifact, around the creation of the artifact, and how the artifact enters, circulates, and fits into the world”), 3) substance (“the content and overall quality and significance of the ideas presented”), 4) process management and technique (“the skills, capacities, and processes involved in planning, creating, and circulating multimodal artifacts”), and 5) habits of mind (“patterns of behavior or attitudes that reach beyond the artifact being created at the moment”). The authors elaborate on the definitions of these five domains by centering each one on a specific example of a student(s) project that they feel best exemplifies each domain. My favorite example was that of context with the example being a class/individual project of creating war poems based on The Things They Carried and the class’ microblog. Each example represents a multimodal project incorporated into a grade school classroom and the strengths and weaknesses that were demonstrated in the final “artifact.” MAP, with its emphasis on the five domains as the focal point, suggest that such projects could encourages students to become active producers of rhetoric and more aware of how they and others are using rhetorical strategies, and be a progressive step towards a better understanding of how to evaluate multimodal projects that go beyond the uniform writing skills that are being taught in accordance with standardized testing. This article was very surprising in just how creative the grade school multimodal project instructions and productions were. The aim of the MAP committee’s project was interesting in that it founded itself upon multimodality, with an emphasis on how students and teachers were operating within rhetorical genres. I was heavily reminded of the reading by Miller (with her idea of fluid motivations for genres) and Popham (with her dissection of boundary genres and the cohesion and tension such meldings can bring). The Google Earth Historical Figures Tour (not quite the right name for the project, but still) was a fascinating boundary genre because students were drawing on skills learned in history and English courses, using technology as the go-between despite that level of technology being an unexpected surprise to the teachers who had simply expected students to use the more traditional PowerPoint. The article itself presented alternatives to the standardized writing assessments that are lacking in many areas that multimodal writing projects could unveil, such as a student’s growing awareness of situational needs that would play into the rhetorical choices they make with their work. By picking and choosing among existing projects being done in various schools (and even a camp setting at a university) the authors did a nice job of uncovering just how well K-12 grade students can learn to adjust and even thrive with writing assignments that go beyond the traditional print platform and the new skill sets that emerge when rhetorical forms are being engaged by youths who are learning to navigate what can be accomplished with advancements in technology while still retaining and honing skills that can be learned with more traditional modes of communication. 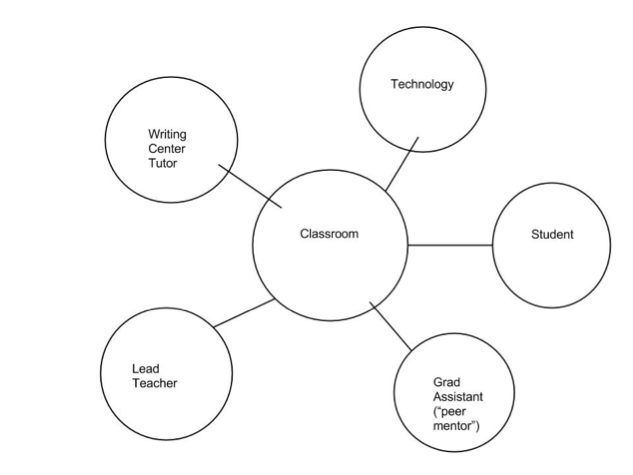 In terms of the Theories of Networks course, this article seems especially useful in that multimodal writing assignments create a network unto themselves between different kinds of technologies, students and teachers, students and students, and students, teachers, and larger audiences involved. One particular example in the article that stood out to me in terms of how a project discussed by the authors became more than just a project but a network of skills and participants/creators was that of the website created by the girls at a technology camp. The girls were broken into groups of 3 and given a short amount of time to create a website that reflected their own emerging digital identities but also that of the camp itself. By collaborating so regularly on specific projects, the girls became a network of shared skills and well as a collective intelligence about the project and camp as a whole. This network then grew larger as the website was put on display as the final project to visiting family members, but then attained a greater sense of network as the aim of the project was to be used for potential campers and their parents. The girls involved essentially created a network between themselves as existing campers, the camp leaders, and anyone interested in the camp as a camper or as the guardian of a potential camper. The multimodality of the project is a physical representation of the collaborative nature of the camp and the relationships between the campers that made the website possible. Reilly, Colleen A., and Anthony T. Atkins. “Rewarding Risk: Designing Aspirational Assessment Processes for Digital Writing Projects.” McKee, Heidi A., and Dànielle Nicole DeVoss, Eds. Digital Writing Assessment & Evaluation. Logan, UT: Computers and Composition Digital Press/Utah State University Press, 2013. Web. In the article “Rewarding Risk” Reilly and Atkins describe a process of creating a method of assessing digital writing projects that encourage students to take risks. In the beginning of the article, Reilly and Atkins discuss the challenges of assessing digital writing projects and the ways in which assessments can either discourage or encourage students from taking risks while undertaking a digital writing project. While students are learning to use new technologies, they benefit from assessments that take into account their attempts to learn to use technologies without punishing them for imperfect outcomes. 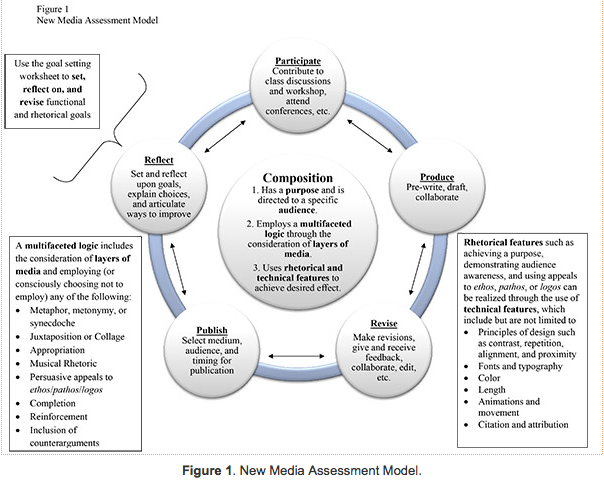 Reilly and Atkins claim that the language of assessments of digital writing projects should be generalizable, generative, aspirational (encouraging students to use new tools and learn new skills), and should solicit student involvement in assessment creation, which Reilly and Atkins claim will localize and contextualize the assessment). In creating assessments, Reilly and Atkins claim that assessment should clearly support pedagogical practices, that the educational values of the course should be evident, that the assessment should focus on instructive aspects of the course, and that the assessment should give feedback to guide future work (2-3). The assessments that are developed for digital writing projects need to be nimble, adaptable, and take into account students’ unfamiliarity with the technologies that they are utilizing. By connecting assessment to student learning outcomes, can help encourage students to learn new skills. Digital writing projects, according to Reilly and Atkins, should include collaboration, acknowledge the way in which writing has changed, incorporate peer review, and include a revision plan (5). The author’s suggest the use of deliberative practice, which “overtly requires a process that includes trial and error, the experience which leads to expanding proficiencies and developing expertise” (5). They say that assessment must encourage students to move past their current skills level and develop their expertise (6). Deliberative practice requires increasing the level of challenge, so assessments should take into account that students will make mistakes in the learning process. Reilly and Atkins say that assessments that students view as a checklist “discourage the deviation and innovation essential to engaging in deliberate practice and embarking on the process of developing expertise” (7). Attempts by both Reilly and Atkins to develop aspirational processes of assessment are detailed in the passage. They suggest that one way to facilitate assessment is to have students write reflections of their experiences working on projects, can help students to think about their work in rhetorical terms, to demonstrate their knowledge of course concepts, top provide rationales for design choices, and to learn through analyzing their experiences (9). Another approach that they explores was the use of primary trait scoring for digital writing assessment (10). This process involves the students into the creation of an assessment that “accounts for the risks they ned to take to complete a project successfully while simultaneously blurring distinctions between formative and summative assessment and making assessment part of the writing process, informing the development, production, and revision of digital compositions” (11). This process begins with assessment of the assignment, and also includes “analyzing the writing performance, and formulating primary traits” (12). This approach acknowledges that student “accomplishments may be much greater than the product they submit” (13). When involving students in the making of the assessment, the assignment becomes aspirational (15). In their conclusion, Reilly and Atkins acknowledge that there are some limitations to the process, such as time-constraints, but they explain the benefits that they have seen in their courses, such as increased student motivation and helping students learn to determine how projects should be assessed. The outcomes and the results suggest that by utilizing the aspirational process of assessment or the primary trait scoring process can increase student motivation and encourage them to take risks as they learn to use new technologies. One way in which the discussion of the creation of assessment of digital writing projects is relevant to the course is that we are ourselves creating digital writing projects that some of us do not necessarily have much experience with. Before my first 894 class, I had a blog but had never really used it. We also use other technologies like Popplet. While I don’t need to know how to write code in the class, I have run into a few issues with Word Press. As I was reading this article by Reilly and Atkins, it occurred to me that some of the writing prompts, particularly the reading notes prompt, were designed to be an aspirational process of assessment. Because we have choices in the type pf content and the format, we students have the freedom to try new things with our blogs. We have the opportunity to aspire to continue developing our skills with blogging. The reading notes assignment prompt accomplishing two things that Reilly and Atkins felt were important in assessment of digital media projects: It encourages experimentation with composing in digital media, and it motivates “students to move beyond the basic activities necessary to produce the digital compositions” (np.). Another parallel that I saw was that some of our assignments (particularly the Mind Map) include built in reflection on the use of technology. Reilly and Atkin explain that using a written reflection for digital projects encourages students to think rhetorically about their technological choices, show knowledge of course concepts, and articulate goals. The written discussions of our Mind Maps help us explain the rhetorical choices that we made and give us a place to delve deeper into how course concepts guided our choices. Vatz and the Rhetorical Situation: How can assessment encourage rhetorical thinking? Reilly and Atkins say that student reflections “about their digital compositions should involve rhetorically oriented rationales of content and design choices” (9). Why is it important that students be able to explain their rhetorical choices? For the answer to that question, we can turn to Vatz. Vatz says that if “you view meaning as a consequence of rhetorical creation, your paramount concern will be how and by whom symbols create the reality to which people react” (158). I think that this quote by Vatz is sheds some light on the ways in which attention to rhetorical concerns can impact assignment design and assessment. 1. By writing rhetorical rationales, students begin to develop an awareness of the ways in which meaning is “a consequence of rhetorical creation”. 2. Reflection on the assignment helps teachers understand the rhetorical nature of their assignment designs. By examining students’ discussions of the ways in which they interpreted and grappled with an assignment, teachers begin to see how symbols [particularly assignment design symbols] “create the reality to which people react” (158). Poe Mya. “ Making Digital Writing Assessment Fair for Diverse Writers.” Eds. Heidi A. Mckee and Dànielle Nicole DeVoss. Digital Writing Assessment & Evaluation. Logan, UT: Computers and Composition Digital Press/Utah State University Press, 2013. Web. 3 February 2014. In “Making Digital Writing Assessment Fair for Diverse Writers,” Mya Poe argues that digital writing assessment must consider fairness in order to provide an equal opportunity to all students. Digital writing assessment is becoming more important due to the rise in digital writing and multimodal composition. Poe presents two theories about assessment and technology: “writing assessment as technology” and “writing assessment with technology. First, writing assessment is a technology. Poe sites the work of George Madaus, who argued that assessments fall under “very simple definitions of technology—the simplest being something put together for a purpose, to satisfy a pressing and immediate need, or to solve a problem” (qtd in Poe). Second, digital writing is being assessed through automated essay scoring (AES). The research on AES is mixed. On one hand it has been shown as reliable. On the other hand, the programs are said to have the “raced ideologies of their designers” (4). In response to this, Poe presents 3 key terms in digital writing assessment: validity, reliability, and fairness. She defines validity and reliability; however, the focus here is fairness. Under the fairness, instructors consider the goal of the assessment and to ensure that students understand the purpose of the assessment. In addition, when interpreting assessments, instructors consider the social context and connect writing program data to institutional data. The fairness guidelines also encourage instructors to gather evidence about digital identities, understanding students’ past digital writing experiences and the nature of those experiences. The Standards “provide us ways to think about the interpretation and use of assessment results” (14). Digital writing assessment has to go beyond traditional rubrics to seeing digital assessment as a way for instructors to make informed choices for the benefit of their teaching and student learning. The questions posed in Poe’s work (and in the entire collection) remind me of our initial class discussion where we talked about defining a network and understanding the affordances and roles of networks. Poe’s work aims at the question: “How might the multimodal, networked affordances of digital writing affect issues of equity and access?” (Preface). This goes beyond questions of access to the network but also the benefits that sad network offers to that particular group. A minority group may have access to the network, but lack the knowledge or ability to capitalize on this access. This could be a network of physical friends and co-workers or a digital network. Poe’s work also made me think of assessment as a kind of boundary genre. Boundary genres are defined as genres that “may actively participate in interprofessional struggles about hierarchies, dominance, and values, helping to create, mediate, and store tensions” (Popham 283). 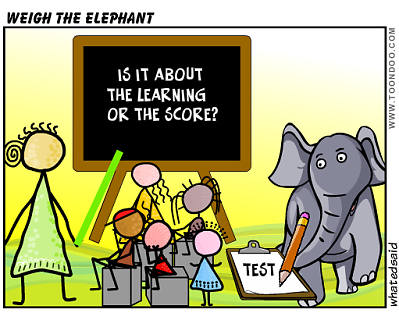 Assessments work in this way, as scholar-teachers we struggle over the role of assessment and when and how to assess. Assessment goes across professional disciplines/boundaries because teachers, administrators, and the public use them to make changes to pedagogy, develop policies, and judge quality/effectiveness, respectively. I am still pondering the connection between boundary genres and networks. Would boundary genres serve as nodes, providing connections between disciplines and groups in order to redistribute information and communicate between different points? McKee, Heidi A., and Dànielle Nicole DeVoss, Eds. “Preface.” Digital Writing Assessment & Evaluation. Logan, UT: Computers and Composition Digital Press/Utah State University Press, 2013. Web. Popham, Susan L. “Forms as Boundary Genres in Medicine, Science, and Business.” Journal of Business and Technical Communication 19.3 (2005): 279-302. Deuren, Joe Van. “Fairness heading” Balanced Life Sills. Web. 3 February 2014. Tarbell, Jared. “Node Garden.” Gallery of Computation, 2004. Web. 3 February 2014. Zoetewey, Meredith W., W. Michele Simmons, Jeffrey T. Grabill. "Assessing Civic Engagement: Responding to Online Spaces for Public Deliberation." Digital Writing Assessment & Evaluation. Eds. Heidi A McKee and Danielle Nicole DeVoss. Logan, UT: Computers and Composition Digital Press/Utah State UP, 2013. Web. 3 Feb 2014. The primary concern explored in this chapter is the evaluation of student-produced civic web sites; these web sites are defined as "community-based digital spaces that can be used to enable public deliberation." The authors explain that there is an inherent difficulty with assessing civic web sites in that usefulness - the ultimate goal of a civic web site - can only be determined after the public has had a chance to utilize the site. However, a student will need a grade at the end of a semester before the public has had that chance to interact with the final project students produce. If the site cannot be evaluated based on its usefulness to the public, then what criteria and methods can be employed to determine a fair evaluation? The authors are clear to distinguish between "usefulness" and "usability." Usability is a site that is easy to use, makes efficient use of graphics and interfaces. Usefulness is the idea that a site helps users "do better work"; the site supports learning and knowledge-making. Civic web sites can be difficult to assess because traditional rubrics favor usability when evaluating digital products; concepts like simplicity, scanable content, and efficiency are privileged. However, civic web sites have a different purpose, which is to provide users with deeper educational content, unfettered access to data, and communicates in specialized vocabularies specific to the field. These criteria are often incompatible with traditional usability rubrics, requiring an alternative method for evaluation. The authors explain their concept of "productive usability" which accounts for these advanced needs and is based on the features that users of civic web sites have identified as being important to the work they wanted to do. Productive usability is based on three main criteria: consideration of alternative use, consideration of technical literacy, and consideration of interactivity. Alternative use is the idea that site creators should consider the multiple ways in which the information may be of use to the public, and they should plan for the kinds of alternative uses that might occur that differ from the creators' intentions. For example, the creators may want a civic web site that provides information for policy makers, but the site may also be visited by citizens looking to become involved in a cause. The site should be evaluated based on whether the creators accounted for the multiplicity of purpose in visiting the site. Technical literacy is the idea that the civic web site is educational at its core, and if people visiting the site are to be able to participate in the discourse, they must have the fluency in the specific jargon used therein. There must also be an inclusion of full-text reports and other data that can be read and interpreted by the user. Technical literacy is the term applied to the jargon and data, and it should be evident on the site in links to data or the inclusion of glossaries. Interactivity is the idea that visitors to the site must be engaged in order to participate in the discourse surrounding the particular civic issue being highlighted online. Interactivity is the pathway to engagement by building emotional and psychological connections to the issue. The site should encourage various forms of interaction to build the sense of engagement and ultimately action. Evidence might take the form of photographs designed to induce an empathetic response or a place devoted to user uploaded narratives. Finding indicators of the three criteria above should also be combined with evidence of the students' process in creating the site. Process-based evidence might include journal-style work logs, which track the groups' discussion and implementation of the three criteria. By evaluating a civic web site based on the indicators and process-based evidence of the three criteria of productive usability, instructors will be able to confidently assess student-produced digital spaces before the public has a chance to determine their usefulness outside the academic exercise. The article describes civic web sites as having "the potential to aid change in communities." This is reminiscent of Miller's work with genre. She explains that we can view genre as being able "to marshal linguistic resources for the sake of social action" (71 "Rhetorical Community"). She continues to argue that genres help "communities do their work and carry out their purposes" (75 "Rhetorical Community"). There are also connections to Popham's claim that "genres are the means by which things get done within a community, ideas get transmitted, and plans get made" (281-2). Both civic web sites and genres are significant because of the work they can perform with a community, for their ability to create action and change. This ability for the audience to perform social action is also linked to the claims by Bitzer. He argues that the "rhetor alters reality by bringing into existence a discourse of such a character that the audience, in thought and action, is so engaged that it becomes mediator of change” (4). Here, the rhetor can be understood as the makers of civic web sites. They bring the site into existence much like Bitzer's rhetorical discourse and the audience reached becomes engaged in the topic enough to foster change. The term engaged is significant especially since interactivity to increase engagement is on of the three criteria the article proposes to use for evaluation. Furthermore, the civic web site is evaluated based on usefulness - the concept that the user can "do better work". This doing of work by the audience is the same as Bitzer's argument that "rhetorical discourse produces change by influencing the decision and action of persons who function as mediators of change" (7). Civic web sites provide the tools and information needed for the audience to do work that will ultimately change a community. The concept of alternative use is related to Popham's ideas about boundary objects. Popham states that "a boundary object serves the needs of multiple sites or multiple professions" (284). This is exactly what makers of civic web sites must take into consideration under the article's proposed evaluative criteria. The site should be agile enough to meet the needs of users that the site-creators may not have in mind as the initial audience; it should be a boundary object that can serve the needs of multiple users. There is also the Bazerman idea from the chapter "Systems of Genres and the Enactment of Social Intentions" embedded here that there is a "multiplicity of action" (90) in texts with multiple intentions and interpretations possible from the same speech-act (87). Alternative use suggests that civic web sites have multiplicity, the potential to be useful to the community in more than one way. We can also see connection to Foucault in the discussion. Consider the following quote from the article: "[The alternative use criterion] requires seeing the audience in context, considering how the information relates to a range of stakeholders, and positioning them as active participants, capable of exploring their own interests." In this sense, the civic web site becomes meaningful in terms of its relations. Foucault is interested in scholars' ability to "analyse the interplay of [concepts'] appearances and dispersion" (35). Creators of civic web sites are evaluated on how well they can analyze how information relates to various audiences, how the active participants will be positioned against the information provided, and where they will be dispersed throughout the field. Foucault is also present in interactivity as the concept is grounded in the theory that there should be "no pre-set entry points or stopping points" (Mirel qtd. in Zoetewey). This is discussed in context of the notion that interactivity and engagement can be reached through user-guided explorations. The web site should be designed in such a way to support this free exploration without pre-set starts and stops. This is like Foucault's ideas about general history versus total description. He writes, "A total description draws all phenomena around a single center - a principle, a meaning, a spirit, a world-view, an overall shape; a general history, on the contrary, would deploy the space of dispersion" (10). By building in a principle of free exploration to enhance engagement, the civic web site is less structured or restrictive, much like the general history using the "space of dispersion". Users are allowed to move as they will through the dispersed space, leading himself or herself to the knowledge and connections important to them. Bazerman, Charles. “Systems of Genres and the Enactment of Social Intentions”. Genre and the New Rhetoric. Eds. Aviva Freedman and Peter Medway. London: Taylor and Francis, 1994. 79-104. Print. Bitzer, Lloyd F.. “The Rhetorical Situation”. Philosophy & Rhetoric 25 Selections from Volume 1 (1992): 1-14. Print. Foucault, Michel. Archaeology of Knowledge. New York: Vintage Books, 2010. Print. Miller, Carolyn R.. “Rhetorical Community: The Cultural Basis of Genre”. Genre and the New Rhetoric. Eds. Aviva Freedman and Peter Medway. London: Taylor and Francis, 1994. 23-42. Print. Popham, Susan L.. “Forms as Boundary Genres in Medicine, Science, and Business”. Journal of Business and Technical Communication 19 (2005): 279-303. Print. Annotated Bibliography Entry: Bourelle et al.